The CENTAUR class was laid down during the Second World War as a follow-on to the earlier light fleet carriers, but with nearly twice the machinery power of the earlier ships (increasing the top speed to approximately 28 knots). With the end of the war, four members of the class were cancelled outright, and the remaining ships were completed to a slightly different design. One ship, HERMES (ex-ELEPHANT), was altered considerably more than her three completed sisters, and is covered separately. 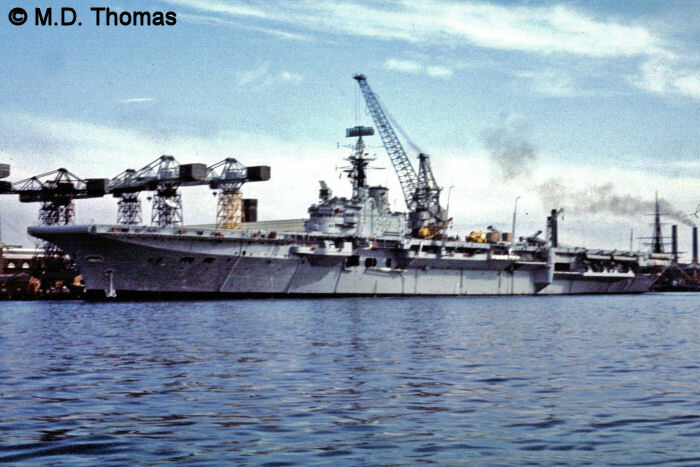 As soon as they were completed, the three ships (CENTAUR, ALBION, and BULWARK) were given interim angled flight decks, and soon after were refitted with steam catapults. Smaller carriers as they were, they were not suited to the larger jet aircraft that were coming into service and were limited to operating the older generation of aircraft. As a result, BULWARK left refit in 1960 as a commando carrier, now carrying 4 landing craft (LCVP), helicopters, and up to 733 Royal Marines. ALBION was given a similar refit, but with added capacity to carry up to 900 marines. CENTAUR was never appreciably refitted, and ended her days looking much as she did when built. 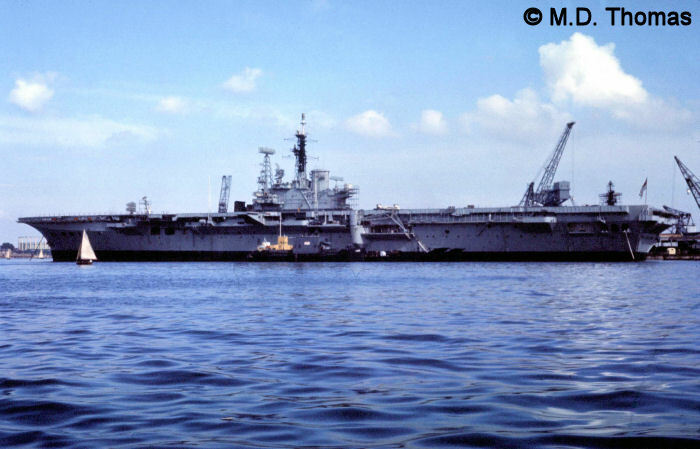 CENTAUR paid off into reserve in 1965, and was used as an accomodations hulk until she was scrapped. ALBION served until 1973, when she was paid off and scrapped. 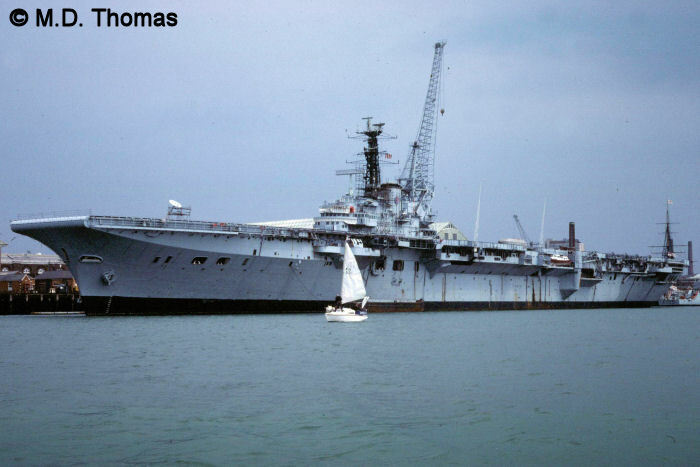 BULWARK lasted the longest, being paid off into reserve in 1976. 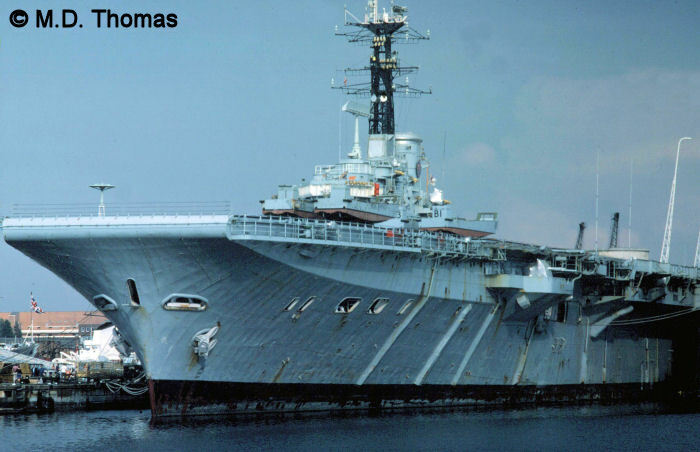 She wasn't finished yet, however, as she was recommissioned in 1979 to allow HERMES to convert to the ASW role. After participating in several amphibious exercises, and suffering several fires, BULWARK paid off for the final time in 1981. She was briefly considered for reactivation during the Falklands War, but this never came about. Aircraft complements are snapshots for the given time periods. Planned 1966 commando conversion cancelled. Paid off 1965, Scrapped 1972. Converted to commando carrier 1962. Paid off 1973, Scrapped 1973. Converted to commando carrier 1960. 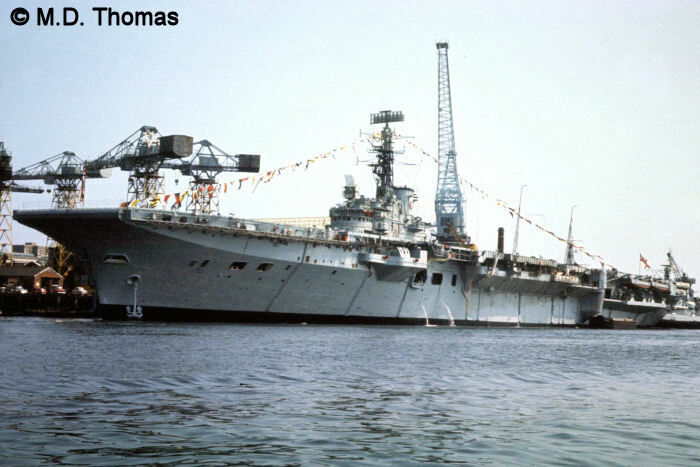 Paid off into reserve in 1976, recommissioned 1979 to fill in for HERMES. ex-ELEPHANT, converted to new design. 1. Aft port-quarter view of CENTAUR. M.D. Thomas Photo. 1. Forward port-quarter view of ALBION. Note the Type 965 radar antenna at the mast head. One of the 40mm twin mounts is visible directly under the bridge, in a sponson. M.D. Thomas Photo. 2. A similar view from slightly further forward. M.D. Thomas Photo. 1. A forward port-quarter view of BULWARK. M.D. Thomas Photo. 2. A closer-up view of BULWARK. A number of LCVPs (landing craft) can be seen arranged on deck. M.D. Thomas Photo.